Balanced scorecard -understanding it matters. In times of change, understanding performance is key to business survival! In the beginning was darkness. We went to work, did our job (well or otherwise) and went home – day in and day out. We did not have to worry about targets, annual assessments, metric-driven incentives, etc. Aahh… life was simple back then. Then there came light. Bosses everywhere cast envious eyes towards our transatlantic cousins whose ambition was to increase production and efficiency year-by-year. Like eager younger siblings we trailed behind them on the (sometimes) thorny path to enlightenment. Early Metric-Driven Incentives – MDIs – were (generally) focused on the financial aspects of an organisation by either claiming to increase profit margins or reduce costs. They were not always successful, for instance driving down costs could sometimes be at the expense of quality, staff (lost expertise) or even losing some of your customer base. Two eminent doctors (Robert S Kaplan and David P Norton) evolved their Balanced Scorecard system from early MDIs and jointly produced their (apparently) ground-breaking book in 1996. Many other ‘gurus’ have jumped on the Balanced Scorecard wagon and produced a plethora of books all purporting to be the ‘Definitive’ book on Balanced Scorecards. Amazon.com shows over 4,000 books listed under Balanced Scorecards, so take your pick – and your chances! 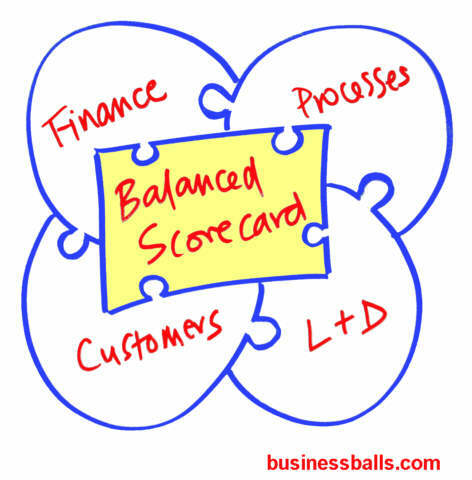 What exactly is a Balanced Scorecard? A definition often quoted is: ‘A strategic planning and management system used to align business activities to the vision statement of an organisation’. More cynically, and in some cases realistically, a Balanced Scorecard attempts to translate the sometimes vague, pious hopes of a company’s vision/mission statement into the practicalities of managing the business better at every level. A Balanced Scorecard approach is to take a holistic view of an organisation and co-ordinate MDIs so that inefficiencies are experienced by all departments and in a joined-up fashion. Once an organization has analysed the specific and quantifiable results of the above, they should be ready to utilise the Balanced Scorecard approach to improve the areas where they are deficient. The metrics set up also must be SMART (commonly, Specific, Measurable, Achievable, Realistic and Timely) – you cannot improve on what you can’t measure! Metrics must also be aligned with the company’s strategic plan. Each of the four perspectives is inter-dependent – improvement in just one area is not necessarily a recipe for success in the other areas. Implementing the Balanced Scorecard system company-wide should be the key to the successful realisation of the strategic plan/vision. There are many software packages on the market that claim to support the usage of Balanced Scorecard system. It is of no use to anyone if only the top management keep the objectives in their drawers/cupboards and guard them like the Holy Grail. Feedback is essential and should be ongoing and contributed to by everyone within the organization. And it should be borne in mind that Balanced Scorecards do not necessarily enable better decision-making! The use of this material is free provided copyright (see below) is acknowledged and reference or link is made to the www.businessballs.com website. This material may not be sold, or published in any form. Disclaimer: Reliance on information, material, advice, or other linked or recommended resources, received from Alan Chapman, shall be at your sole risk, and Alan Chapman assumes no responsibility for any errors, omissions, or damages arising. Users of this website are encouraged to confirm information received with other sources, and to seek local qualified advice if embarking on any actions that could carry personal or organizational liabilities. Managing people and relationships are sensitive activities; the free material and advice available via this website do not provide all necessary safeguards and checks. Please retain this notice on all copies. © Sandra McCarthy and Alan Chapman 2008. Balanced Scorecards explanation, examples, aims, implementation and teaching aid diagram for the concept..